Weed and Plant Control: prevent ugly and aggressive weeds from taking over your yard with our selection of weed killers and fungicides, available in both sprays and granules. Grass Seed: if your grass has worn patches or thin areas, spruce it up with specially-formulated grass seed. Choose from several types and textures of grass to match the look of your lawn. 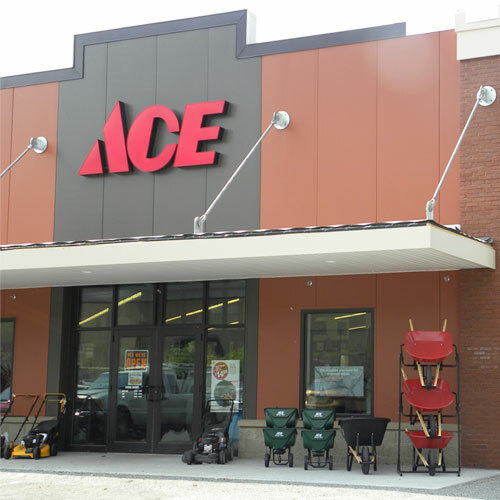 Lawn Fertilizers: cultivate lush, green grass with lawn fertilizers from Ace. Choose between natural organic, inorganic and synthetic organic fertilizers to find the best option for your yard. Plant and Tree Protection: protect your plants and trees from harsh outdoor elements with guard covers, tree wraps, leaf shine spray and other defensive items. Plant, Tree Food and Fertilizer: provide plants, flowers and trees with the nutrients they need from our selection of plant foods and fertilizers. Lawn Food: help your lawn grow strong with lawn food from Ace. Our lawn food promotes healthy growth in lawns, plants, trees and shrubs. Plant Stakes: shape and support the growth of climbing vines, including fruits and vegetables. Our plant stakes are made from heavy duty wire or plastic to provide a sturdy structure as plants grow. Mulch: mulch helps soil beds moderate temperatures, reduce weeds and retain moisture during dry spells. Browse our selection of red, black, brown or rubber mulch to find the perfect fit for you. Along with these products, be sure to take advantage of our soils and conditioners, soil test kits, spreaders, sweepers, sprayers and watering tools. Our full assortment of lawn care products will help you get the gorgeous yard you've always wanted. If you need help picking out the garden supplies you need or getting inspiration for your next big project, don't forget to visit our tips and advice page.